It’s a sparkling summer morning in Palma, Mallorca, and the crew of the 105-foot sloop Gliss (derived from the Dutch word glinsteren, which means to shine or glitter with brilliance) is waiting for her owner and his guests to arrive. The cook has already returned from the market with fresh produce, local bread, and freshly caught sea bass. At the appointed hour the owner’s party arrives onboard, and the crew prepares to set sail. At noon the lines are cast off, and by 1230 Gliss is outside the harbor just as the first ripples of the afternoon sea breeze start to appear on the water’s surface. With the push of a button the main halyard starts raising the mainsail from its furled position in the boom. Once it is up and properly trimmed, the high-aspect blade jib is slowly unfurled. 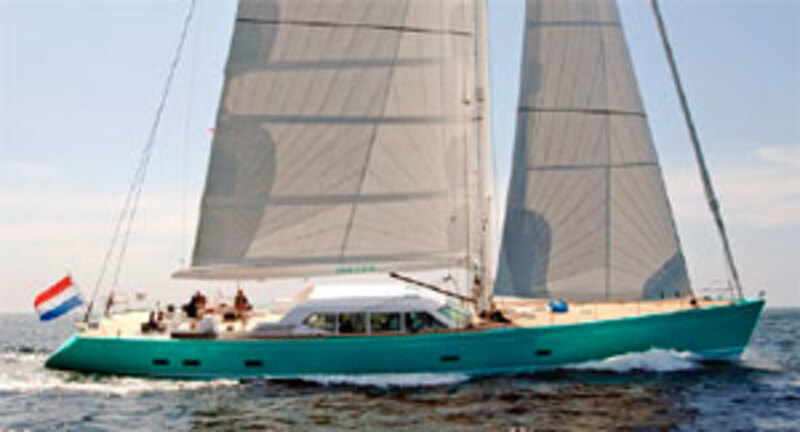 The wind grows stronger, and the yacht’s striking turquoise hull begins moving through the water. Gliss crosses the bay in just one tack, running at 11 knots in the steady 12-knot breeze with her leeward rail nowhere near the water. Once the yacht reaches the far side of the bay, the owner has a brief discussion with his guests about whether they want to keep sailing or would rather duck into one of the many anchorages along the shore and have a swim followed by some aperitifs and lunch. The decision is to anchor, and when a suitable spot has been chosen, the crew furls the sails and raises an anchor arm that is hidden under the foredeck. It is this feature that allows for such a clean look up forward. The anchor descends into the clear water, there’s a quick burst of reverse, and Gliss is soon resting majestically. Her wide transom platform is quickly opened, the swimming ladder is installed (with a pile of towels bearing the yacht’s logo neatly laid out next to it), and the guests frolic in the 75-degree water. Once back aboard, they enjoy a warm deck shower, a drink, and some appetizers served by the attentive crew. If none of this seems particularly exciting to you, you could perhaps be forgiven. But when you’re talking about a 105-foot yacht that is primarily a daysailer, these are the experiences that are memorable. Instead of beating into a fierce headwind through flying spray with two reefs in the main and a storm jib set on the inner forestay, many owners prefer to spend their leisure time in a pleasant anchorage like this one. They don’t want to sail their yachts across oceans; they want to swim, relax, and take a siesta after a long, often sophisticated lunch. What makes Gliss unique is that she is one of the first yachts of this size to be designed specifically for luxurious daysailing. What happens on deck is more important than what happens below. In fact, a major point in the owner’s design brief was that the deck be a place where guests can see everything, enjoy sailing the yacht, or, if they wish, just lie in the sun or relax in the shade. To this end, one of the yacht’s important design features is her flush deck. Forward of the mast there is nothing but teak deck and flush hatches. Amidships, a coachroof with glass windows covers a deck saloon with comfortable seating. Farther aft is a sunning platform, plus sailhandling and steering stations, and then more teak deck leading to the transom. The area under the coachroof is a key feature. There is no air conditioning here, but the adjustable windows are designed to precisely control the amount of air flowing in. To keep guests comfortable there are settees and twin gimbaled tables from which people can eat and drink without worrying about having something slide into their laps—even when the yacht is under full sail. At the forward end of the saloon are twin navigation stations. All sail- and boathandling can be performed from here or at the steering stations aft; call the area an integrated pilothouse. Behind the saloon are two sun beds, a sail-control area, and then the two steering stations. All is arranged so that the only reason you might ever want to go below is to visit the head. To truly enjoy daysailing on a yacht this size, you do need to take the wheel while the yacht is under way. Standing at the helm when the yacht is sailing at 11 knots gives you a feeling of power and control. Being able to trim the huge main and jib by simply pushing some buttons on the console certainly adds to this sensation. Many yachts this size are designed to keep guests and crew away from the water, but this owner asked designer Philippe Briand to create deck spaces that would intensify the sensation of sailing. He also asked for the same sort of shelter he had on his previous yacht, but Briand took the coachroof concept much further and developed a new approach. Because Gliss’s belowdeck spaces are secured with two watertight hatches at the forward and after ends of the deck saloon, the area underneath the coachroof is not considered interior space by the yacht’s insurers. The time Briand spent thinking about where to place items so guests can enjoy the views from the deck has paid off. For example, as the bow lifts you can see, from under the coachroof, the spray coming over the bow and also watch the foam streaming along the side of the hull to leeward. The finish work by Royal Huisman is to the highest standard, with many unusual details; these include push-button sliding windows in the house, concealed hatch hinges, pop-up cleats, the concealed anchor roller, recessed furlers, plus lots of custom hardware by Rondal. Although the design brief was focused on the daysailing experience, Peter Beeldsnijder, who drew up the interior plan, also created very spacious and seamanlike areas below. There are two double guest staterooms aft, along with the owner’s expansive stateroom that runs the full width of the yacht. This space has every amenity, including enormous clothes cabinets, an L-shaped settee to starboard, and a huge bathroom and shower. The area under the deck saloon is occupied by engine spaces, and there is no way to go forward from the aft cabins without going on deck. The aft companionway is at the aft end of the saloon the forward one is between the twin nav stations. The aft companionway steps descend from the deck to a corridor covered with a handsome lime-washed French oak veneer that is both informal and elegant. Moving aft to the staterooms, you pass the conveniently located day head. All the door, cabinet, and drawer hardware is custom made. The forward companionway leads down to a cosy saloon and rainy-day entertainment center with two sofas and a coffee table. It’s the only place below the main deck where a group can socialize. Directly across to port is what I have no hesitation calling a five-star pilotberth. Because it’s located in the middle of the yacht where motion is minimal, it’s the perfect place to catch a deliciously luxurious nap. The galley and crew quarters are immediately forward. They enjoy the sort of space and joinery normally seen only in owner and guest areas. There’s full standing headroom in the engine spaces. The Scania engine is light and has a fully controllable variable-pitch propeller, so there is no need for a reverse gearbox. Soundproofing and fire insulation are installed over floating floors, a construction method that makes engine noise and vibration seem almost nonexistent. Moreover, all the yacht’s floors and bulkheads are sheathed in a cushion of special rubber and never come in direct contact with the yacht’s hull. Briand has given the yacht a moderately deep bulb keel with a trim tab and a deep carbon-fiber rudder. This combination, I’m happy to report, allows the yacht, despite its size, to respond quickly to even small changes in sail trim. Push a button, and the hydraulic Lewmar winches take charge of the sails. All that remains to be done is to keep one eye on the compass heading and the other on the rudder-angle indicator. On a yacht this size, these two elements become the most important telltales. We are pleased to have designed this yacht for an experienced owner who is very sensitive to aesthetics. The focal point of the design is the deck saloon, which is open at the aft end, with a permanent coachroof. Because the side windows slide down, this feature not only makes the area well ventilated, it also opens up the space to the exterior surroundings. The saloon is about 50 feet long and has a total area of about 750 square feet; a space this large has never before been installed aboard a yacht this size. Guests can enjoy this area whether they want to be involved in sailing, catch up on their reading, or simply enjoy the sun.